Prepare to fall in love! You've been looking for a stunning lot (1.64 acres), gorgeous sunsets, panoramic views, grassy space for the kids to play & a cul-de-sac where you can gather with friends & neighbors on summer afternoons! 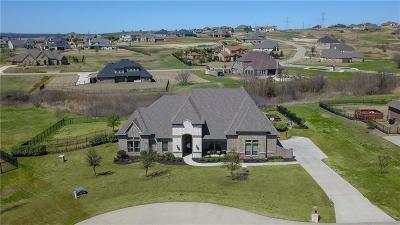 You prefer gated communities, Aledo ISD, rolling hills & a lot that backs up to the greenbelt. Welcome home ... to this open concept, light & bright home featuring perfect spaces for the way you live. Elegant dining, a chef's kitchen with custom cabinets, exotic light granite, spacious island, breakfast bar & sunny breakfast nook, split bedrooms, a gorgeous Master suite for you to relax & unwind at the end of long days, & an upstairs room with full bath & walk-in attic! Come & see!